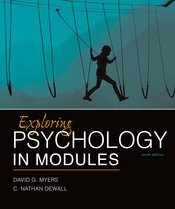 This Exploring Psychology in Modules is the first to include Myers’ handpicked co-author. Nathan DeWall shares Myers’ belief that instilling a sense of curiosity and inquiry about psychological science is an effective way to help students navigate the content, think critically, and prepare for a lifetime of learning and living. The extraordinary, longtime Myers ancillary author team is also here—a group whose teamwork, consistency, and commitment again sets the industry standard for instructor and student supplements. The high quality that consistently sets Myers’ ancillaries apart sees a new incarnation in LaunchPad. This course space organizes all the book’s digital resources in an online format that makes it easier for instructors to teach, track, and assess their students. This text offers the content organized in 45, student-friendly modules, assignable in any sequence and brief enough to be read in one sitting. Students digest material better when they process it in smaller chunks—as spaced rather than massed practice—and instructors often appreciate the flexibility of assigning any modules in any order.